Mia Sheffield glances through her Italian Cinema class web page and studies her notes, coffee in hand. No powerpoint presentations. No laptops. No phone service. Just an hour and 15 minutes of frantically writing as the professor lectures in his Italian Cinema course. “Great,” I think. “It’s the first Tuesday of the quarter and I already want to drop the class.” I mean, I am a Communication major so technically I could... But no, it satisfies a requirement I need for General Education. Besides, it wouldn’t hurt to learn more about the culture. So, I stayed. And I am truly glad that I did. Inspired by my family roots in Italy and my obsession with spaghetti, I decided to dip my toes into the culture, society, and entertainment of the country. 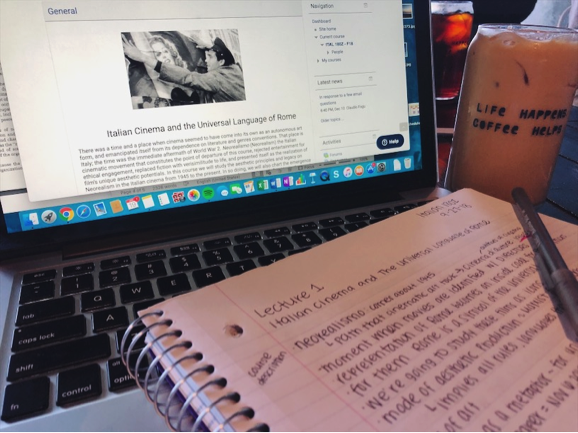 As a Communication major, I would never have thought that a course in Humanities and Fine Arts would play such a huge part in enriching my time at UCSB. The films that we watched in the course spoke for much of 1945 to the present in Italy: the dark hardships and brutal poverty faced after World War II in Rossellini’s Open City and De Sica’s The Bicycle Thief, abstract cinema in Antonioni’s The Eclipse, and an economy consumed by images and desire in Fellini’s La Dolce Vita and Nichetti’s The Icicle Thief. Professor Claudio Fogu passionately engaged the class, keeping me on the edge of my seat and away from perusing Facebook or online shopping. That is the goal, right? For me, staying engaged became an easy task with a newfound compelling subject. 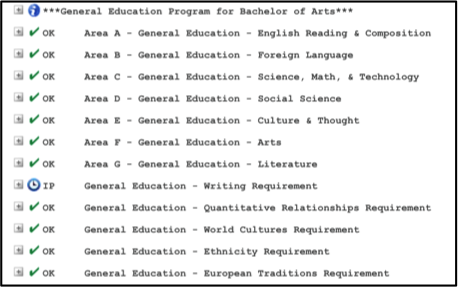 Throughout my years at UCSB I have wondered: why are General Education requirements even necessary when each student is working towards their own desired major? In order to graduate from the College of Letters and Science, particularly for a B.A. degree, students must satisfy the “General Subject Area Requirements” which includes Areas A through G, and the “Special Subject Area Requirements” which include the Writing, Quantitative Relationships, World Cultures, Ethnicity, and European Traditions Requirements. I was putting so much time and effort into classes like Oceanography and Astronomy for a set of requirements with seemingly no personal benefit. Upon entering my third year, I decided to try something new regarding how I went about taking these GE’s. Ditch the requirement mindset. Find topics that sound intriguing, explore a creative side, or immerse in a new culture. It was this course in the Italian Department that not only answered my question but helped me to see these requirements less as a chore and more as an opportunity to expand my educational horizons. Contrary to my previous beliefs, GE’s are essential and can be an enlightening experience when one chooses the right classes. I’m thankful I stayed in class after that first day, an Italian Cinema course that resonated with me and taught me how to appreciate academics outside of my major.